(CNN) -- After weeks of silence, the sister of one of the two American journalists imprisoned in North Korea finally got a phone call. 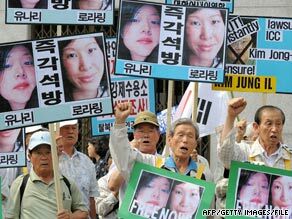 Supporters rally for U.S. journalists Euna Lee and Laura Ling on June 4 in Seoul, South Korea. "It was only the first time I had heard her voice in weeks. ... I was so relieved but I feel so helpless," Lisa Ling, a CNN contributor, told affiliate KOVR in an interview Wednesday. "Because as an older sister, a best friend, a self-professed 'doer,' it's just difficult to know I cannot do anything to bring her home." "I know that our government has been working behind the scenes very hard trying to bring the girls back home," she said. But she added, "Our countries don't talk, and perhaps this could be a reason." She said her sister "was very specific about the message that she was communicating, and she said, 'Look, we violated North Korean law and we need our government to help us. We are sorry about everything that has happened, but we need diplomacy.' "
Ling said that without being able to look at her sister, it was difficult to tell how she was doing. She described the past few weeks as being engulfed in a "terrifying and deafening" silence. The two detainees -- who are reporters for California-based Current TV, a media venture of former U.S. Vice President Al Gore -- were arrested while reporting on the border between North Korea and China. The North's state media released a "detailed report" last month, saying that Ling and Lee entered the country illegally to record material for a "smear campaign" against the reclusive communist state.